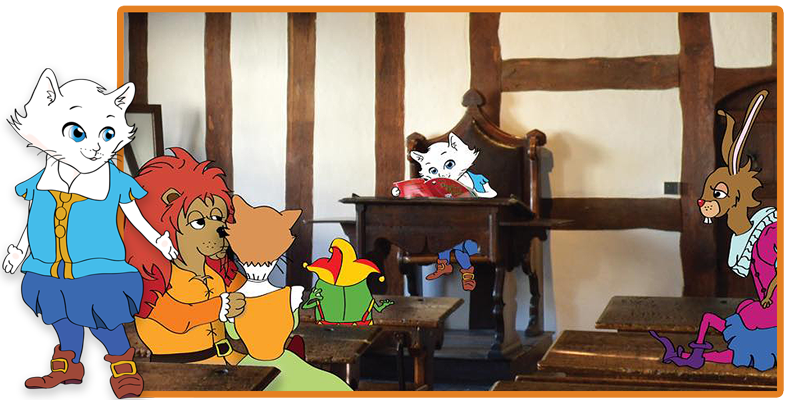 A wonderful time was had by all today at Shakespeare’s Schoolroom, Stratford-Upon-Avon, exactly where Shakespeare himself had his own story times! We had many beaming faces listening to Shakespeare’s stories as retold by Shakespeare’s adorable little white cat, Shakespuss and his friends, including the wonderful ‘Bottom’. Even though we had a few little giggles at the mention of his name. You could've imagined Shakespuss himself sitting in the corner of the room, purring away! Interestingly, although ’Bottom’ is one of the comic characters we all love, he is probably one of the most important players as he’s the one person that the audience can often relate too. When the plays where originally written, Nick Bottom’s job in the time of Shakespeare was a Weaver and a ‘Bottom’ was the name given to something a thread was wound around. It is only later around the 18th Century, well after Shakespeare, that the word was associated with the part of the body we all sit on. So next time you hear the characters name ‘Bottom’, remember … it’s not what you think! If you didn’t make it today, then we are here again tomorrow and the 2nd June. So why not pop down and say hello! Like any parent, when Melissa had children she wanted them to enjoy all of the things she had considered to be important and wonderful in her experience. In her adult life she had come to love the works of Shakespeare, his still relevant insights into life, his colourful humour, and his ability to use the English language so adeptly. Based on A Midsummer Night’s Dream,‘Puck’s Magic Flower’ is focussed entirely on the troupe of actors in the play, and their interaction with the fairy King and Queen. Taken from Shakespeare's play ‘The Tempest’, the book ‘Monsters’ centres on a single comic scene within the play containing only three characters, Caliban, Trinculo and Stephano. Portia's father a rich merchant dies leaving her a vast fortune. However, before she can inheriet his fortune, Portia has to marry but can only choose her husband by her fathers terms. Wow! We have just seen the cover of the next book! Shakespeare will eventually become a familiar friend, something to be cherished. "Capturing a child's imagination, is much easier the younger they are!" © 2017 Mailer-Yates. Shakespuss & Co Ltd.